After three straight road races in the NASCAR K&N Pro Series East where Scott Heckert had the field covered, someone finally had an answer — at least on one lap speed — for the road racing ace on Saturday at Virginia International Raceway. Fellow championship contender Austin Hill, driving the No. 22 A&D Welding/Don Rich Ford, shot to the top of the scoring pylon on his sixth lap around the 2.25-mile North Course at VIR, then upped the ante on his 10th circuit to end the session with a quick lap of 1:29.307 (90.698 mph) in preparation for this afternoon’s Biscuitville 125 (4:30 p.m. ET). Heckert was not far behind, however, posting a time of 1:29.423 (90.581) on his final flying lap to slot in second-fastest overall in the No. 34 Project Lifesaver Chevrolet for HScott Motorsports with Justin Marks. Heckert has won the last three road races in the NKNPSE, including last year’s event at VIR, and says that despite what the time sheets say, he’s not worried about having the speed to contend for another win. Series points leader William Byron was third-fastest in the end, but was mired in the back half of the top 10 on speed for much of the 45-minute session after being black flagged for smoke just three laps into his practice time. Undeterred, Byron bolted forward with two minutes remaining, posting a lap of 1:29.599 (90.403) in the No. 9 Liberty University Chevrolet. 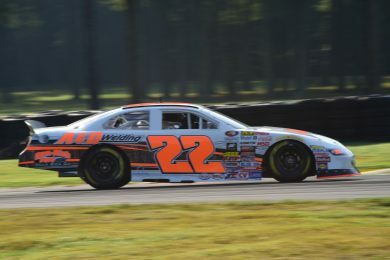 Another driver with considerable road course experience, Ben Kennedy Racing’s Kaz Grala, was the only other driver below the minute-and-a-half mark, ending up fourth-quick (1:29.972/90.028) in the No. 3 Kiklos Toyota. Fellow Toyota stablemate Nick Drake rounded out the fast five. Road-course specialist Dale Quarterly, making his first K&N East attempt since last fall at Dover, was sixth, and HScott Motorsports with Justin Marks teammates J.J. Haley, Dalton Sargeant and Rico Abreu were seventh, ninth and 11th, respectively. 15 cars of the 18 entries took time in the opening session, with Abreu running the most laps of anyone in the field (18) ahead of just his second-career road course start. Final practice begins at 10:05 a.m. local time, with another 45-minute block for K&N East cars to dial in their setups for the 55-lap, 125 mile race later in the day. Jacob Seelman is the Managing Editor of Race Chaser Online and creator of the Motorsports Madness radio show, airing at 7 p.m. Eastern every Monday on the Performance Motorsports Network. Seelman grew up in the sport, watching his grandparents co-own the RaDiUs Motorsports NASCAR Cup Series team in the 1990s. He is currently studying Broadcast Journalism at Winthrop University in Rock Hill, S.C., and is also serving as the full-time tour announcer for both the United Sprint Car Series and the Must See Racing Sprint Car Series.